If you feel attracted to a profession which reaches out to others, which encourages you to call yourself into question and which enables you to share with others the joy of practising yoga, here is some basic information which will help you to decide whether the training programme for this demanding profession that is provided at the Eva Ruchpaul Institute is right for you. 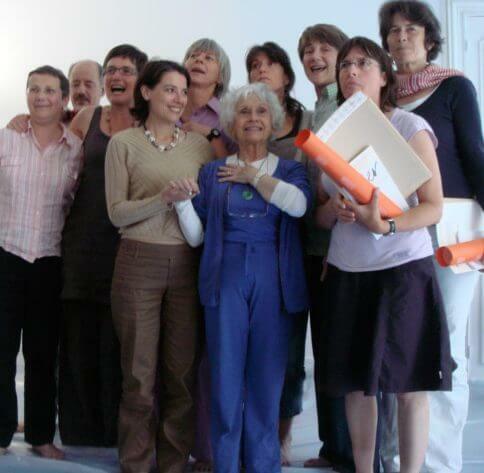 For over forty years now, the Eva Ruchpaul Institute ( a private institute of higher learning registered at the Paris Academy ) has dispensed a course to train future yoga teachers. This training course is founded on Eva Ruchpaul’s rigorous pedagogical approach, and is built around a prescribed ethical approach to the practice of yoga (see The Teachers’ Charter). To be able to teach hatha yoga to everyone by adapting the lessons to the students, while at the same time respecting the physical integrity and psychic autonomy of all individuals. The training programme for teachers is specific in that it seeks to assimilate and adapt oriental thinking to the givens of the western world. To do this the course offers equal time to the acquisition of knowledge and to the sharing of experiences. The practical and theoretical analysis of the yoga postures and their different applications. A keen awareness of the task incumbent upon a secular yoga instructor, who is able to stay impartial in his/her approach towards both eastern and western traditions. The study of postures in small groups allows student teachers to take into account individual differences. Interactive workshops provide the opportunity for teaching practice so that the student teacher acquires the ability to observe a class and to react appropriately to a given situation. The use of audiovisual tools allow the student teachers to vision their performances. This facilitates individual assimilation as well as the revision of specific points. The programme provides for learning/revising in Anatomy and Physiology. These two subjects are indispensable for the profession of teaching yoga. A comparative study of the major currents of thinking in both eastern and western traditions is undertaken. The relationship between teacher and student in the field of yoga is analysed. A study of human behaviour is undertaken in the following domains : diet, states of fatigue, emotions, states of conscience (cerebral rhythms). Applicants should have the Baccalaureat or an equivalent title. They should also have at least three years of yoga practice. Admission is then subject to the approval of the teaching team. The standard course is over a period of three years. Then after having practised for several years as a teacher, there is the possibility to undertake a one-year Master’s programme. For the Master’s programme, teachers are required to carry out a critical analysis of their professional practice by means of a written dissertation. The dissertation is then presented orally before a panel of teacher trainers. – 602 hours of professional training is needed to obtain a teaching diploma. – et 79 hours of study are required in order to obtain a Master’s certificate. This part of the course is in the hands of specialists who have expert, cutting-edge knowledge and vast experience in their respective fields. Year 1 : Lectures in Anatomy through movement : the locomotory system and muscle behaviour in movements. Year 2 : Theory of postures ( in-depth analysis of the postures from the articulo-muscular point of view ; their psychological impact ; where to place them in the lesson ). Year 3 : This final year is devoted to the study of pedagogy, which varies from lesson to lesson according to the circumstances : ( respect of bio-rhythms, difficult individual cases and counter-indications ) ; the rôle of the teacher ; professional ethics ; the teacher-student relationship ; teaching practice which involves taking resonsability for a yoga class in a Paris municipal gym. The study of the major currents of Indian thinking and the philosophy of yoga. Psycho-physiology : A study of the important functions of the human body and their links with the practice of hatha yoga. Theory lessons are recorded and are accessible via Internet in the case of students who live too far to travel regularly to Paris. Harmonious development of postural technique. Compliance with rules concerning the taking of regular exams over the three-year period, including a final exam at the end of year three. Submission of a dissertation which is prepared over the three year period. Student teachers who do not reside in Paris or the Paris region must be present for a minimum of 24 hours per month. Michel Bitbol, physicist and philospher – Stéphane Benoist, historian – Basarab Nicolescu, quantic physicist – Alfred Vidal Madjar, astro-physicist – Christiane Berthelet Lorelle, psychoanalyst – Dr Bruno Courtaigne, gerontologist – Dr Alain Carré, occupational medecine – Dr Bertrand Gachot, infectious diseases specialist – Kirone Malik, physicist – Dr Ines Kint, nutritional therapist – Dr Paule Soler-Nadal, endocrinologist, These experts have all made presentations at the Eva Ruchpaul Institute in recent years. More than 1,200 teachers have graduated from the Institute since it was established in 1971. One third of the graduate teachers come from provincial France. The fourth year of training is available to those teachers who have successfully completed the three years of initial teacher training. Fourth-year graduate students can avail themselves of various learning opportunities whilst intensifying and broadening their practice of yoga. During the year, they are required to undertake a personal research project based on a topic of their choice, which draws on their knowledge and experience as a teacher. The project is presented in written form (dissertation) and also defended orally. 12 hours with the supervising teacher during the course of the year. It is necessary to obtain the unanimous approval of the teaching staff at the Institute and the approval of the personal yoga instructor, as well as fulfilling all the requirements for the diploma. This fourth year is not compulsory. It is designed to further the knowledge and expertise of qualified teachers who wish to use the tools and structures of the Eva Ruchpaul Institute to continue their professional development.